COLUMBUS – Today, Senate Minority Leader Joe Schiavoni condemned a lawsuit filed by the Electronic Classroom Of Tomorrow (ECOT) to block the Ohio Department of Education (ODE) from doing a full audit of the school’s attendance records. ECOT argues in the lawsuit that they are not required to “provide” education to their students. They assert that they are only required to “offer,” or place, the courses online. Senator Schiavoni’s Senate Bill 298 would require e-schools to accurately track and report student attendance in order to ensure that students were logged on and learning. The bill has received four hearings in the Senate Finance Committee, but has yet to receive a vote. Below is a screen capture of a spreadsheet from the Ohio Secretary of State’s website. (I typed in “Lager” into the search field and changed the dates to 01/01/2015 to 12/31/2015.) I removed the columns that had irrelevant info, like addresses and such, so you could better view the important information. And it fits on the screen better. In 2016, ECOT’s owner gave away $210,085 in political donations. Actually he didn’t give it away. I’m sure he’s expecting something in return, like maybe stalling SB 298, to prevent him from being held accountable? There has got to be an ethics violation in here somewhere. William Lager gave $210,000 this year in donations, is given millions in tax dollars, and runs the school with the lowest graduation rate in the country, and the politicians he supports celebrate his successes? Bill Lager, the ECOT man, certainly knows how to gain the favor of state officials. The June 5 ECOT graduation speaker was Cliff Rosenberger, the Speaker of the House. Senator Coley introduced the speaker. Senator Coley is on the Senate Finance Committee where SB 298 was blocked from passage this spring. This bill requires online charters to verify they are serving the students for which they receive funding. Education expert Diane Ravitch picks up on the corrupt ethics of Ohio’s legislative leaders and ECOT’s owner. The online charter school has an on-time graduation rate of 20%. Students get credit for “participation” if they log in for only one minute. Despite ECOT having the worst graduation rate in the country, Ohio’s devious leaders celebrate the school and the low percentage of students who do graduate. From 2000-2013, William Lager, ECOT’s owner, has donated $1.4 million to Republican politicians in Ohio. Of course, he has given more since then. What screams UNETHICAL more than this? 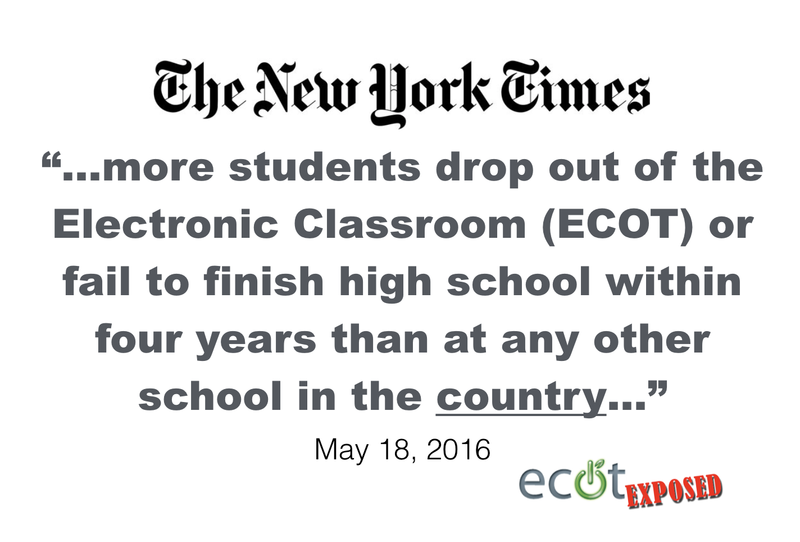 It doesn’t matter how egregiously ECOT has been failing K-12 students who take classes from home on a computer. 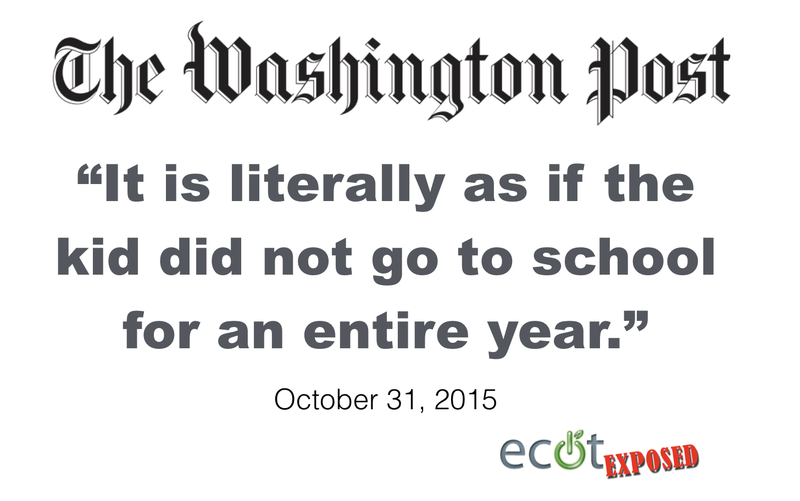 It doesn’t matter if ECOT students are even logged in let alone learning. It doesn’t matter if the online charter giant gets F grades in most state assessment categories. The political will to right what’s wrong with electronic schools is nonexistent. When Ohio Republicans boarded Mr. Lager’s gravy train they left the educational welfare of thousands of students behind. The plan to enrich for-profit businesses — if not students — can be summed up in two words: dilute and delay. Mr. Lager and friends got a legislative delay until after the November election to twist arms and derail charter school quality efforts — again.